It’s getting hot. The 4th of July is almost here, and while I’ll be taking in a White Sox game on the South Side with my dad, I figured it best to leave you all with a few deep cuts from America’s poet, Bruce Springsteen. Sure sure, everyone knows “Born in the U.S.A.,” “Born to Run,” “Born Dancing in the Dark,” “Born on Thunder Road,” “Born on the Streets of Philadelphia,” and “The River,” but here are ten lesser-known tracks to get you through the long weekend, arranged in barbecue order from Lighting Up the Grill to Sleeping on the Couch with the Meat Sweats. Though it originally appears on Springsteen’s debut, Greetings From Asbury Park, NJ, it took the E Street Band a couple of years to learn how to play it the way it was meant to be played: this version is as loud, terrifying, and redemptive as the lyrics themselves. And, at half the length of Born to Run’s “Jungleland,” it’s Springsteen as skin-kneed playwright in his most economical. The lyrics are over and done with in the first three minutes, but the story doesn’t end until Bruce and Little Steven Van Zandt trade wailing leads over a chugging E Street train. Following “Tenth Avenue Freeze-Out” isn’t the easiest thing for a song to do. But “Night” is where Bruce formed the template of exalting the everyday that he would expand upon with Born in the U.S.A. To the wailing lead of Clarence Clemons’ sax, Springsteen shouts, “You work all day to blow ‘em away in the night.” That line is something of a thesis statement for Born to Run, and, as a result, something of a creed for anyone in their mid-20’s with nowhere to go. Hear me out on this one. Yes, Robert Downey Jr. sang it on Ally McBeal, exposing the slick underbelly that most of Springsteen’s songs have; it’s one of the side effects of being a showman, after all. And while the lyrics themselves are a tale of half-threatening to send the mother-in-law back to the ghetto, the party rock atmosphere provided by the cadre of backup singers makes forcing the old lady to walk the streets of Queens seem to be a pretty decent thing to do. But the song is really made by Danny Federici’s organ and Bruce and Van Zandt’s shouting harmonies in the chorus, along with their sticky-city solos. I’d also like to contend that Rancid could not have made …And Out Come the Wolves without it. Dig the way those organs and guitars weave; that’s straight-up East Bay. By the middle of his career, Springsteen excelled in disguising workaday laments in dancehall jumper’s clothes. This track — one of only four on Born in the U.S.A. not released as a single — is no different, setting a highway flag-waver’s struggles to get out (what else?) to a dancey rhythm. The track has an early rock feel to it, from the shuffle of the intro guitar to Bruce’s “woo-hoo-hoo”ing at the end, but the high point comes when the E Street Band drops out and Springsteen confesses, “One day, mister, I’m gonna lead a better life than this,” and you can’t help but believe him. Songs like “Working on the Highway” are the reason that Born in the U.S.A. resonated with 15 million Americans: Bruce’s voice, and the hope that comes with it, gives dignity to people that great music often ignores. For his second record, Springsteen moved away from the wordy Van Morrison-isms of Greetings in favor of a funkier, jammy side that eventually refined itself into the muscle machine of Born to Run. 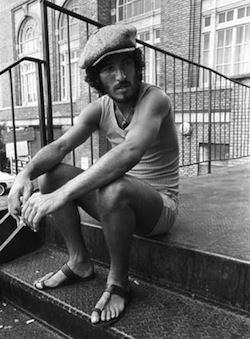 “Kitty’s Back,” along with “Rosalita,” is early-period Bruce at his finest: the track swings and bounces along on a bed of rusty horns and galloping bass. And really, this song builds and sways with arguably more tension than any other E Street song. : even when the horns give way to organ sweeps, we have the sense that this thing is far from over. When Bruce finally leads E Street through the “whoa-oh”s and hand claps of the chorus — at the five-minute mark, no less — it’s impossible not to jump along with them. Falling somewhere between the starlight funk of “Kitty’s Back” and the Common Americanism of Born in the U.S.A., with a stop through southern California, this track finds Bruce exploring themes he’d come back to again and again (including the line “the highway is alive tonight,” which would resurface twenty-five years later in the chorus of “The Ghost of Tom Joad”). But, like “Sherry Darling,” “Seaside Bar Song” exists for one reason: to be sung along with, arms around one another, smiles across faces, eyes closed. Springsteen has never been one to shy away from experimentation, but 2006’s Seeger Sessions — my second favorite record of that year — strips away any kind of cultural cadre associated with the Boss’ name and plops him into the swampier outskirts of New Orleans, somewhere between a church and a juke joint. The song, which is just as Klezmer as it is gospel, stomps and rolls like nothing else in Springsteen’s catalog. The themes of faith and redemption have always figured prominently in Springsteen’s writing — the author Walker Percy even wrote a young Springsteen, complimenting him on his deft usage of Catholic imagery — but they’ve always been greased by the doubt and confusion that come with the pressures of living that faith out in a world of honest temptation. In Springsteen’s world, the ability to believe is part of the nobility of the men and women about whom he is writing. “Reason to Believe” is no different, telling a straightforward story of the strength of faith in the face of tragedy. I’m one of those rare critics who will defend “Born in the U.S.A.” I’ll even sit you down, look you in the eye, and tell you that I think that the title track is among the best songs Bruce has ever written and recorded; his vocal performance on that record is unparalleled. But even I have to admit that that’s not the way “Born in the U.S.A.,” a by-now familiar tale of a veteran’s having been abandoned by the country he gave his life to serve, was meant to be heard. This version, recorded during the same sessions that eventually yielded the acoustic Nebraska, puts all of the focus on the lyrics. Unlike the furious speaker of the album version, the main character here is weary: Uncle Sam has him under his thumb, and he’s straining from squirming. The BOSS! 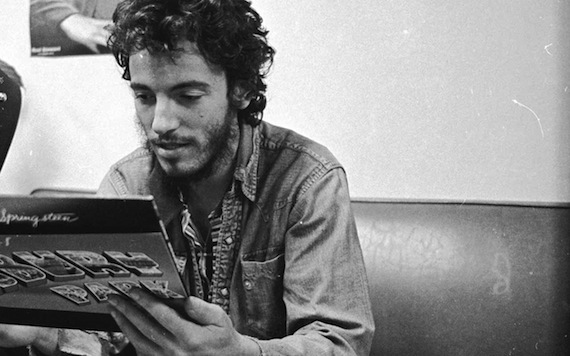 This is a great chronology of Springsteen classics. Awesome post, and relevant because of Fourth of July where “Born in the USA” is sure to be played one billion times around the country. Nice write up on Bruce. So glad to know someone else loves ‘Working On The Highway’. That album was our family’s vacation anthem for many years as I grew up. “Darlington County” is another song that is under-appreciated. Perfect post as always …. Great list of Springsteen. Agreed on Born in the USA and this being a better version. Agree on all–especially “O, Mary” and “Sherry Darling” and “Workin’ on the Highway” and… (though my favorite line from that is “One day I looked straight at her and she looked straight back”). fantastic write up, great list. This list is equally excellent 5th July listening on the other side of the Atlantic, just so you know. And I too will defy critical consensus on Born in the USA, and proudly so! Great list, I’m glad I found it. BTW, NPR’s All Songs Considered has a post on “most intense performers of all time” and the Hammersmith ’75 concert is mentioned. Way to dig out some of the great, under appreciated songs in the catalog. It’s really ridiculous how many great songs this man wrote from 1975-1985, a record comparable with Paul McCartney 1965-1975. +1 on Born in the U.S.A. One of the most influential records ever made – you can’t listen to any form of Nashville pop-country (Kenny Chesney through Eric Church to Kid Rock) and not hear the influence of this album.